Wiff Rudd began teaching trumpet and serving as Brass Area Coordinator at Baylor University in 2002. Previous teaching posts include Oklahoma Baptist University and the University of Arkansas. A founding member of Rhythm & Brass, he is also an active soloist, chamber and orchestral musician. He has been a featured soloist in Carnegie Hall on multiple occasions and at several National Trumpet Competitions and International Trumpet Guild Conferences. Rudd has performed and presented master classes at more than 350 universities and music festivals on five continents. He serves as principal trumpet with the Waco Symphony and performs regularly with the orchestras of Houston (Moscow 2012), Dallas (Europe 2013 and 2016), and Harrisburg. Baylor’s trumpet ensembles have won six prizes at the National Trumpet Competition since 2009, including three first place wins. 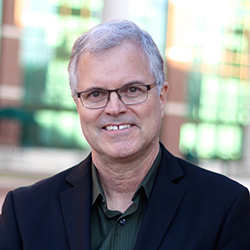 In 2010, Rudd received the Award for Outstanding Teaching and was named the Centennial Professor, which provided funding for research in collaborative practice. The resulting book, Collaborative Practice Concepts, was released at the 2013 and has been adopted by many university trumpet studios across the country.